The WinForms PDF Viewer control supports viewing, reviewing, and printing PDF files in WinForms applications. The hyperlink and table of contents support provides easy navigation within and outside the PDF files. Open and display both normal and PDF files protected with AES and RC4 encryption algorithms (password protected). Open PDF files from stream, file path, and PdfLoadedDocument objects. The WinForms PDF Viewer supports printing the PDF file loaded in it. It supports two types of printing. Printing using print dialog - Select the destination printer, number of copies, and other details in the print dialog to print the PDF file. Silent batch printing - Print the PDF files without user interaction, which helps in batch printing multiple PDF files continuously. The PDF Viewer comes with a powerful built-in toolbar to execute most important actions such as page navigation, view mode, and print. 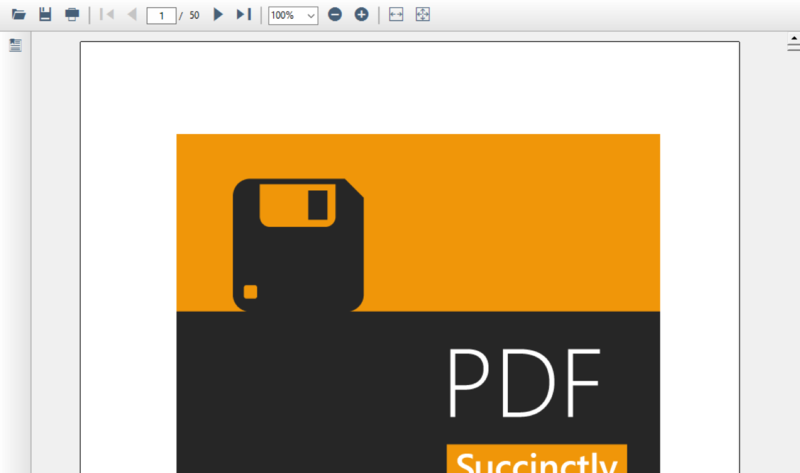 You can design your own toolbar with PDF Viewer APIs. Hyperlink navigation - Hyperlink navigation feature enables navigation to URLs (website links) in the PDF file. Table of contents navigation - Table of contents navigation allows users to navigate to different parts of the PDF file that are listed in the table of contents section. Create a custom toolbar with all the options that can be performed using the built-in toolbar. Convert pages of the PDF file into JPG, PNG, TIFF, BMP, and EMF formats. The scaler exportation comes with the customization of dimension and DPI.